The 2017 Beijing International Publishing Forum was held in Beijing on Aug. 22, with the theme of "The Belt and Road Initiative and International Publishing Cooperation." Cui Yuying, deputy head of the Publicity Department of the Central Committee of the Communist Party of China (CPC) and vice minister of the State Council Information Office, addressed the forum. 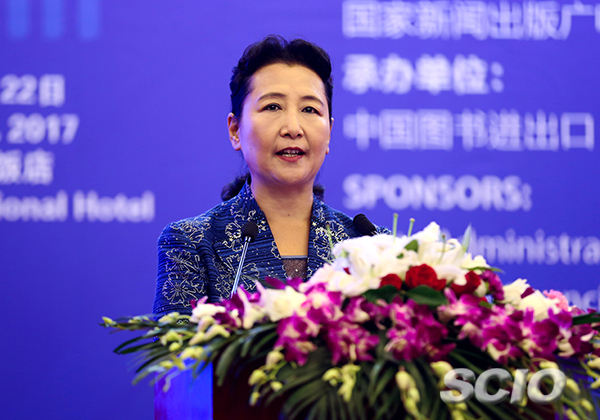 In her speech Cui stated that since the Belt and Road Initiative was proposed four years ago, various fields including the publishing industry have made remarkable achievements and will continue moving forward. With the Silk Road extending from the East to West, the publishing industry should shoulder greater responsibility in ensuring more exchanges between various civilizations and people along the route, Cui said. She cited the book "Xi Jinping: The Governance of China" as an example of Chinese books going global. The book, according to her, has been published in more than 100 countries and regions and offers the world an insight into President Xi's governance ideas and the aspirations of the Chinese nation. The publishing industry across the world should seize the opportunities brought by the Belt and Road and the new round of industrial and digital revolution, Cui said.